Examining a meteorite named Tissint, scientists have found small fissures that were filled with carbon containing matter - and it may be of extraterrestrial biological origin. 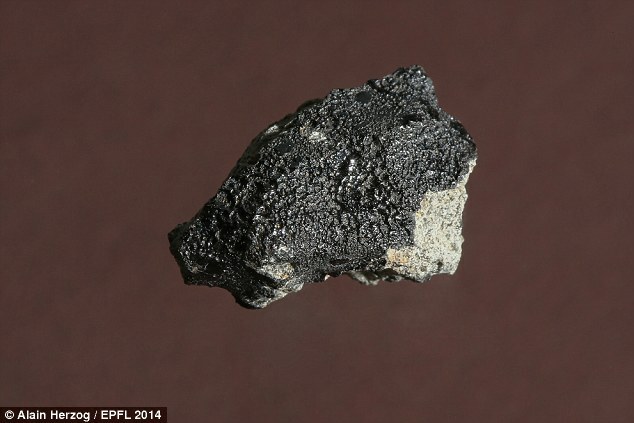 The Tissint meteorite fell to Earth in the Moroccan desert on 18 July 2011. It was ejected from Mars after an asteroid crashed into the surface 700,000 years ago, sending debris into space - some of which made its way to Earth. And this meteorite, the fall of which was seen by several eyewitnesses, seems to bear signs the red planet was once habitable. Dr Philippe Gillet, director of EPFL's Earth and Planetary Sciences Laboratory, and colleagues from China, Japan and Germany performed a detailed analysis of organic carbon found in the meteorite. They concluded that it very likely had a biological origin. The scientists argue that the carbon could have been deposited in fissures of the rock when it was still on Mars by fluid that was rich in organic matter. 'So far, there is no other theory that we find more compelling,' said Dr Gillet. Other studies of the meteorite have agreed that carbon in the meteorite is organic. However, there has been a debate as to where this carbon came from. A study in 2012 proposed that the carbon came from the crystallisation of magma at high temperature on Mars - ruling out a biological origin. This is supported by some properties of the meteorite's carbon. Most notably, the ratio of the carbon 13 isotope to carbon 12 was similar to coal on Earth. This is important because coal has a biological origin - namely dead plant and animal matter. In the study the researchers also ruled out the chance the carbon had come from Earth - and they are now increasingly sure this meteorite proves life on Mars once existed. 'Insisting on certainty is unwise, particularly on such a sensitive topic,' warns Dr Gillet. 'I'm completely open to the possibility that other studies might contradict our findings.